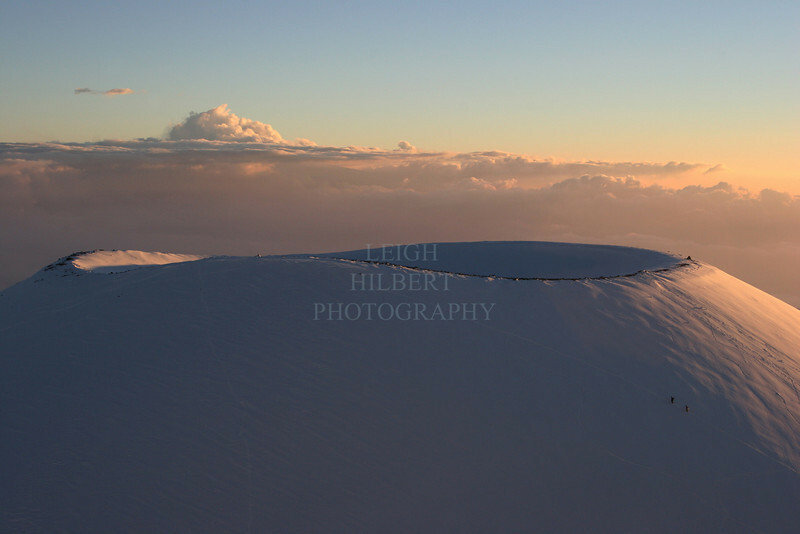 Massive cinder cone on the Island of Hawaii and two snowboarders hiking up her slopes for one last ride down. Directly behind me as I took this photo is the higher peak of Mauna Kea. Mauna Kea means “White Mountain” in Hawaiian. It is 13,796 feet (4,200 meters) high from sea level to highest cinder cone summit. It can snow on the top any month of the year but usually has the largest accumulations in January and February. Considerd the finest location for telescopes in the world, the summit of Mauna Kea — the highest point in the Pacific — is considered "wao akua," or the realm of the gods by Hawaiians; traditionally sacred for Hawaiians as the meeting place of the sky god Wakea and the earth mother Papa: the birth of the first Hawaiian peoples.